At the beginning of 2015 my family realised that living in Sydney, even out in Western Sydney as we were, wasn’t working for us. Too much stress, too much traffic & not enough space. I had been working from home for over a year at that point. My wife & I had talked about getting out of Dodge for years, and we decided that if we didn’t want to regret never trying it we had to do it now. One of the fantastic perks of working for Section is that I can work from pretty much anywhere with an internet connection. So we sold up our small house on 500m2 & bought a 2 acre property in the NSW Snowy Mountains, which is about as far removed from our previous suburban life as I could find while still having access to internet that didn’t require a satellite dish. We now live in a town of about 800 people up in the snowies, and it’s been amazing, I now wake up to kangaroos hopping through our yard, as opposed to what it used to be, which was constant traffic. Other than the kangaroos driving my dogs insane, the transition of my family from suburbanites to country folk has been surprisingly smooth. 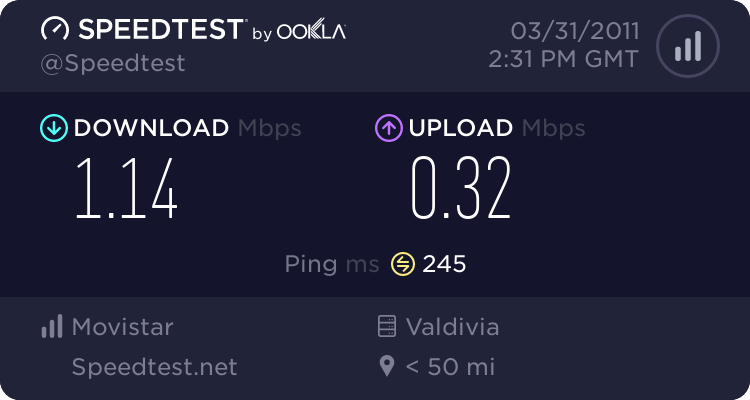 Despite the surprisingly decent ping time, it’s pretty bad. Skype calls with my colleagues were embarrassing and forget about trying to screen share. It did improve a bit, later I was getting around 5Mb/s down with about 0.5Mb/s up, but still, pretty terrible. Oh, and this was for $93 / month (inc. line rental) with a 200GB cap. With 4 kids in the house and me working from home, we blew through that cap every month, I used up all three of the free topups in the first three months, on the fourth month we got shaped for the last few days. One of the other connectivity options I had investigated before we moved here was CountryTell’s point to point wireless offering. This had looked quite attractive as it was about $80/month for symmetrical 20Mb/s unlimited data. 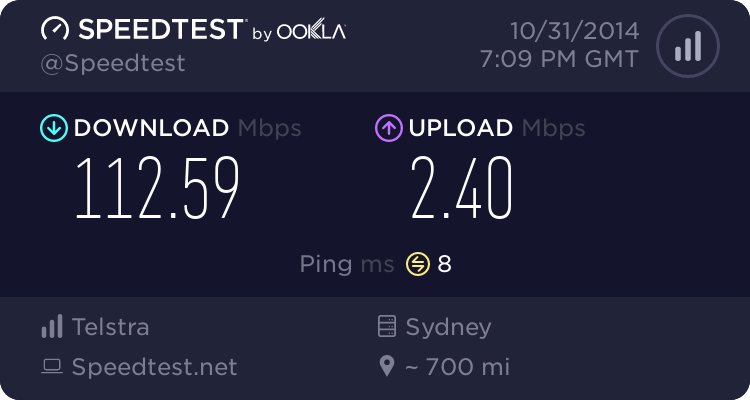 I had few illusions that we would actually get 20Mb/s symmetrical, but people I had spoke to about it said it was stable and fast. Unfortunately, just as we moved here CountryTell had a problem with their supplier for their wireless units and stopped selling their residential wireless service. 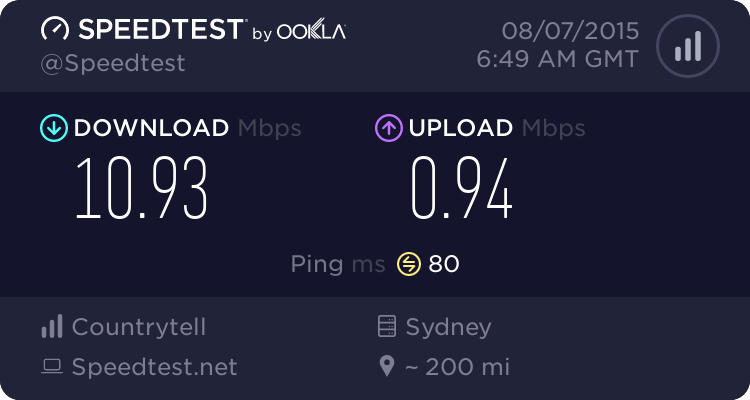 So I signed up for Telstra, hoping CountryTell would come back up as an option. Which they did. Unfortunately they had redone their plans and pricing by that time and were now offering as 12 down 1 up Mb/s plan for $99/month. Still unlimited though. Ah well, it’s working now, so I’m happy. I’d rather be here with the sub-optimal speeds than having to be in the middle of the city to get over 100Mb/s. As I sit here watching the sun set over the mountains, I can’t really complain. What is HTTP/2 and Does Your Website Need It?